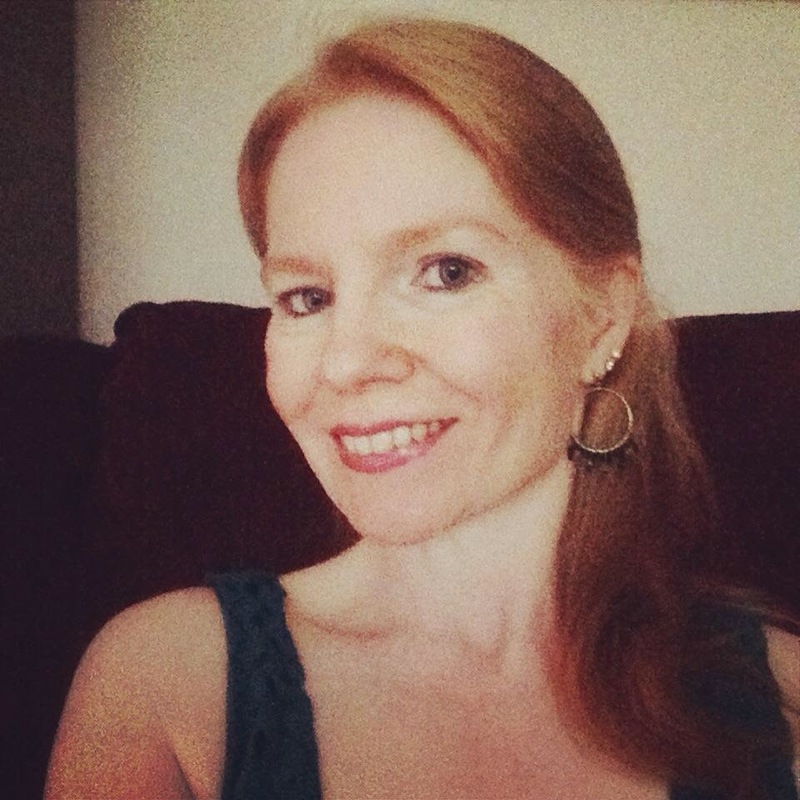 Interview with Jill of "The Peyton Heart Project"
My chat with Jill Kubin the creator of Peyton Heart Project. I'll have more comments after the interview. Maria- Tell me how The Peyton Heart Project started? Jill-I wanted to create a random act of kindness movement that could spread around the world. I wanted it to raise awareness for suicide, bullying and other mental health issues. After having helped my older daughter with her hat organization, I knew that people who knit and crochet tend to be kind-hearted people. I thought that having them make hearts would not only be an easy and quick project for them, but it would also be one that they would embrace. So many people have been impacted by suicide and by mental health issues either through their close circle of friends or their family. 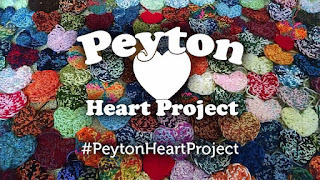 People seem to really identify with the mission that the Peyton Heart Project has and that is what is making this project resonate with people around the world. Maria- What’s your main goal of Peyton Heart Project? Jill-To raise awareness about suicide & bullying and to help stop the stigma associated with mental health issues. Maria- How can someone help or be a part of this? 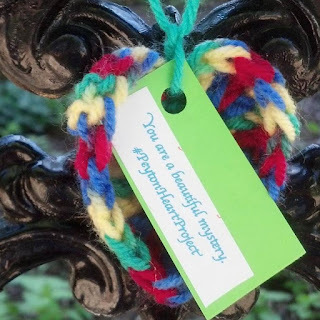 Jill- People can help us by knitting or crocheting hearts. Once made they would then attach our quotes and hashtag to a tag on each heart and scatter the hearts in public places for people to find. Maria- Who are the members of this project? Jill- I created the Peyton Heart Project but Peyton's dad, David James, helps me manage the Facebook page whenever he has the time. Maria- Are there other projects that you’re involved in? Jill-Yes. I help my two daughters with their nonprofits. Emily, age 20, runs Emily's Hats For Hope Initiative. We make and distribute winter hats and scarves to people who are homeless and disadvantaged around the world. Julia, 15, runs the Sidewalk Smiles Campaign. Her focus is on ending teen suicide and bullying. Maria- What kind of feedback are you receiving from those who find the hearts? Jill- They are enthusiastic and often say that the project and its message hold special meaning to them. 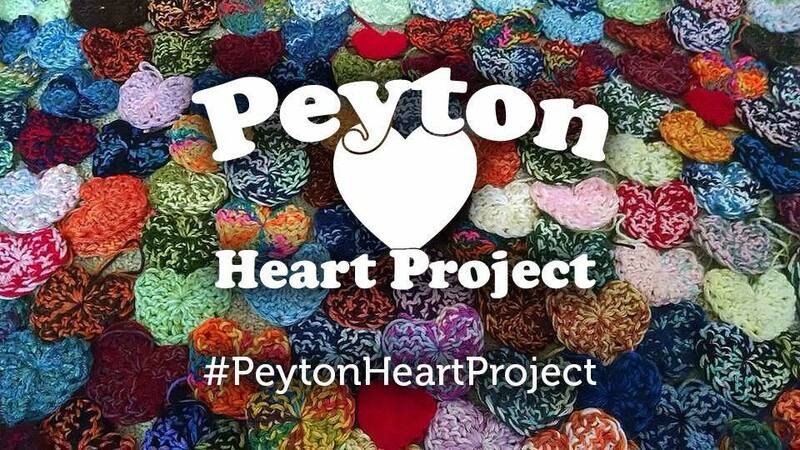 They often write about how suicide or mental illness have impacted their life and that the Peyton Heart Project is helping people talk about a difficult topic. Maria- What would you change in this world, if you had the power to do it? Jill-I would end the stigma of mental illness. Doing so would allow people to speak more openly about their depression and their struggles and it could ultimately help them to seek help instead of resorting to suicide. Maria- Would you like to see this project reach our President? Jill- Peyton's dad recently sent the President a Peyton Heart Project heart. We are waiting to see if we hear back. Maria- And maybe have a day that would honor Peyton’s memory? From what I’ve read, his legacy is living on through this project. His story has touched lives and probably saved lives as well. Jill- Every person lost to suicide is just as important as the next person. We are not looking to have a specific day that would honor Peyton because through this project we honor Peyton's memory every day of the year. Maria-Do you have anything like a book or a quote or even a song that keeps you motivated to stay involved with this? Jill- What keeps me motivated with this project are the news stories I hear about teens around the country who continue to take their lives. Knowing that there are kids out there who don't want to wake up tomorrow and face another day...that's what motivates me to continue the Peyton Heart Project. I like what Jill says how the project honors Peyton's memory every day of the year. I believe the crochet hearts with their heartfelt message will save lives and encourage those who are hurting. I imagine that they have already saved some lives. It was very encouraging to speak to Jill about this project and to know that there are people who care about others and want to encourage someone who is going through a dark time whether it's depression or bullying. A message that has always helped me in a difficult time was "this too will pass" and it's true. Even though "this too will pass", we do need other ways of dealing with emotional or mental health issues like comforting words or someone listening without judgment or seeking help with a counselor. Teens who are being bullied need to know that someone cares for them and loves them. I can relate because I was bullied in school several times in my life, and those times were difficult. I survived it, but it wasn't easy. I am proof that you can get through it and that you can learn to be loving and caring despite what happened to you in your past. Let's be a voice of encouragement with the ears to hear what someone is going through, and don't just listen with your ears but listen also with your heart. If you would like to help spread hearts or be a part of The Peyton Heart Project, please write to the below address or comment on the social media links listed below as well. I'm getting involved to help spread HOPE in this world.